Saturday, January 13th @ 7:00PM – Only $23.95 per seat! 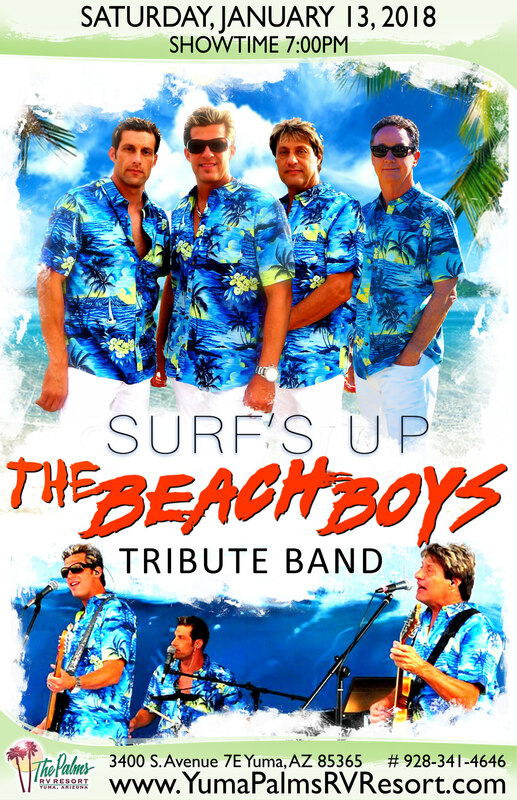 Surf`s Up Beach Boys Tribute “Just like the real thing but Younger” … Surf`s up is one of the first true Beach Boys tribute bands in the world. They have been perfecting & recreating the Beach Boys sound for 25 years. Literally, since they were kids. Keeping it in the family – the band consists of 2 brothers Donny & Danny Goldberg, their father Don Goldberg Sr. who founded the group and close cousin Denny Hardwick. Their sibling harmonies capture the authentic blend of the Beach Boys like no other. Not just another “tribute band”, these veterans naturally bring the magical “Sound of Summer” to your event. Surfs Up Has Played: Jan & Dean Show with living Legend – Dean Torrance, Disneyland Anaheim, Disneyland Paris France, Disney`s California Adventure, Long Beach Toyota Grand Prix Headliners for Huntington Beach’s annual 4th of July Show 5 years running.